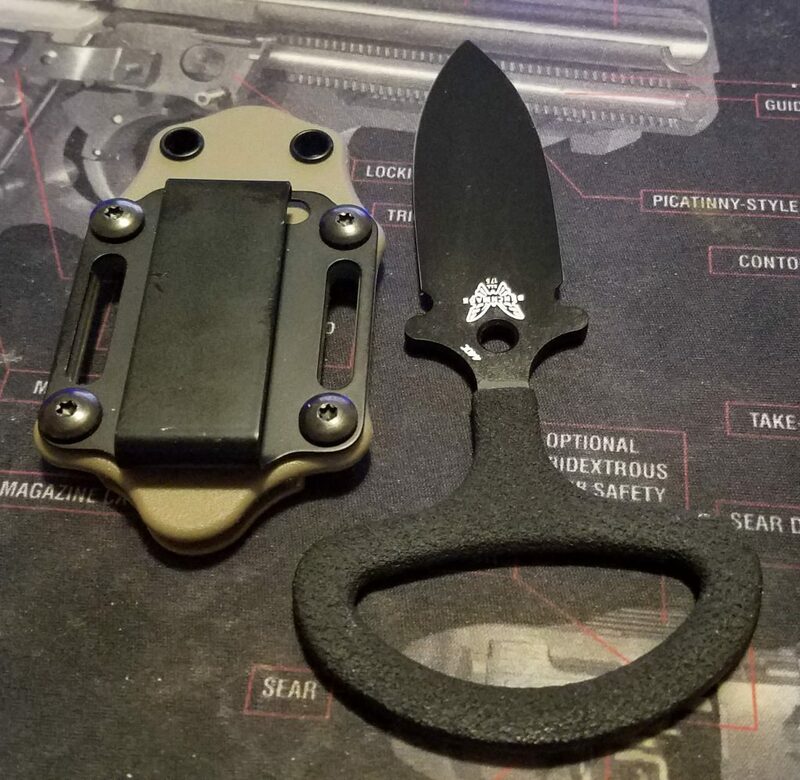 There’s not much to say about the Benchmade Adamas Push Dagger that hasn’t already been said on many a knife forum, blade magazine, or YouTube Video… at least when they first came out. Really not much about them ever since. And I find that a little curious. Because this knife is with me quite often. Even into places where weapons are strictly verboten. It’s a frequent carry item because it’s just so bloody good at being exactly what it is there to be. Your Backup. The blade is two and a half inches of simple 440C Steel, with an overall length of about five and a half inches. It’s a simple Chisel Grind blade, flat on one side, beveled on the other… with an edge that is exceptionally, wickedly sharp. The D-Ring shaped grip fits in the palm of your hand very well, allowing the shank to pass comfortably between your fingers so the blade can extend naturally between your fingers. Because this is a Push Dagger type knife. It’s not intended for any utility work, it’s not a lightweight kneck knife or anything of the sort. 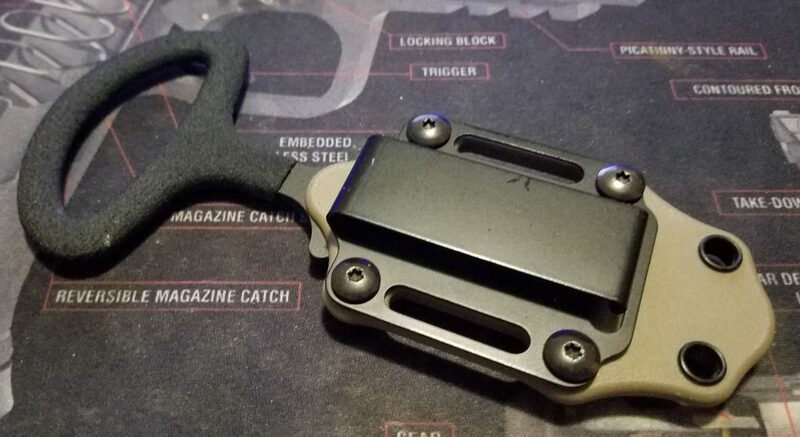 So the grip is just caveman simple. A simple rounded semi-ring shape, covered in a rubberish-dip like material. This knife isn’t for trimming your nails at church like some foppish gentilman’s knife. It’s not meant for batoning wood for fire building, processing small game for a camp meal… nope. This knife is straight up mean for stabbing fools. That’s it. To help with that Last Ditch defensive use, it has a neat little sheath that I like a lot. It’s an injected molded plastic, with loops on either side and an option bolt-on steel clip. I find that it does great on a belt, and does great positioned in the SOB. Small of Back. And that’s where you forget you have it. Until some jackwagon tries to steal your sweetroll. The knife and shealth is lightweight, and pretty compact. The knife only weighs two and a half ounces. This gives you a lot of Get Off Me capability in a very small package. I have not stabbed anyone with it, but I did punch-stab the crap out of some totally deserving ISIS boxes. The penetration was effortless. The blade felt like it had no resistance, even with multiple layers of cardboard. But I know that’s no real measurement of anything substantial. But this thing just makes you want to stab something. So I figured evil cardboard had to get cut. The knife is held very securely in the sheath thanks to molded in detent inside the lip of the sheath on one side, and the round hole at the base of the blade. So the knife snaps in and snaps out with a small degree of effort. It’s not coming out on its own. You could run a chain or some cord through this and use it as a neck knife. I guess. You could also use it as a boot knife… but there are better options for that. But on the belt is probably best, or strapped to your Load Bearing Equipment if you are Infantry, Battle Belt or Gun Belt if you are a LEO, or maybe to the straps of your backpack, rucksack, or Murse. Carry it someplace where it’s going to be easy and fast to get to if you need it. Somewhere that you can get it if someone is at bad breath distance. These are not cheap blades by any means… But then again they are not that expensive either. Not considering that this could be the knot at the end of your rope in your hour of need. It’s not for everyone, and it offers no utility other than making Throat Punches more Final. And some might say that these are not as good as the Cold Steel Push Daggers, and maybe that’s correct. 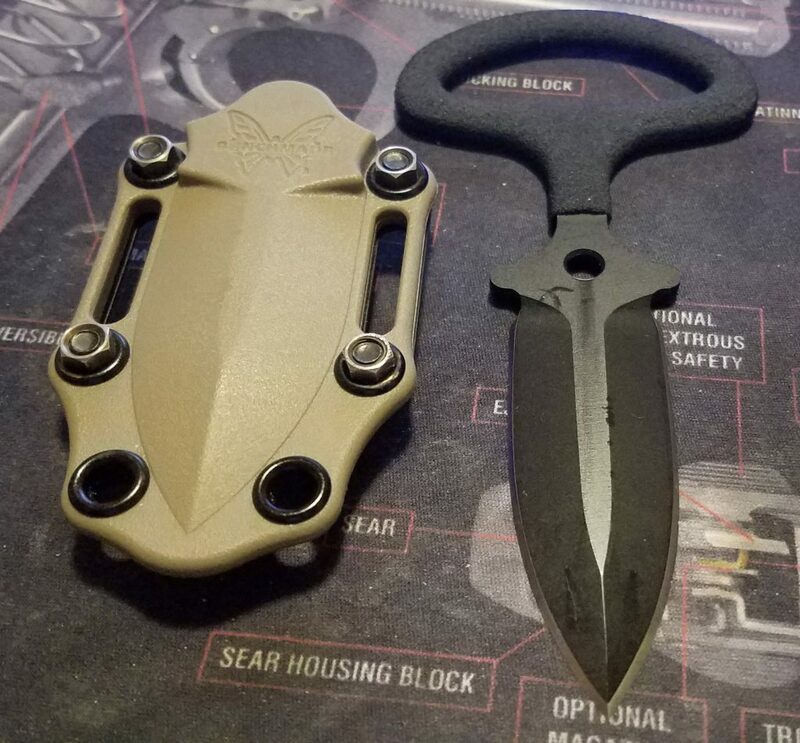 But the fact these carry so freaking well, and are so small and light… you are going to be able to have this where you might not have the other push daggers. So there’s that going for you… which is nice. Nasty piece of work, that. 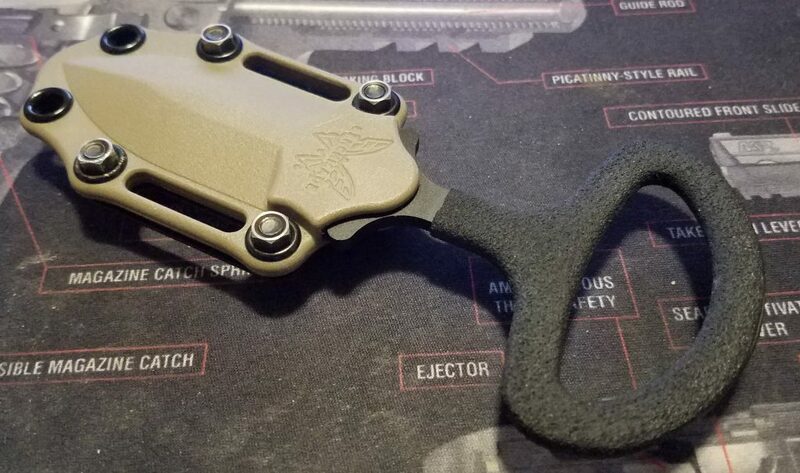 As you say, pricey, but the quality of the sheath is where most blades of this type stumble and Benchmade looks to have gotten it right the first time out. Illegal in my state (WA) and I suspect many others. 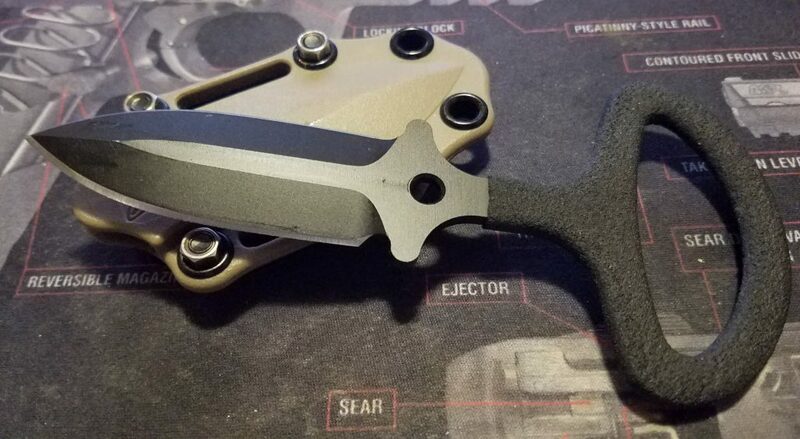 How about an article on why you are such a fan of Bowie style blades over others such as drop or clip point. I am thinking general utility/field/camp type knife. I have never been a fan of the Bowie type, but your experience is obviously greater than mine when it comes to field knives.